Looks like yellow is the duke...and probably the winner. It is a time when barons go to war. The king is dead, spring is in the air, and the time is ripe to annex lands, build mountain fortresses, and raid opposing villages, all in the name of assuming noble titles. Time is short, and the world is small. Can you overcome your opponents in your quest for the crown? Find out in Barony! 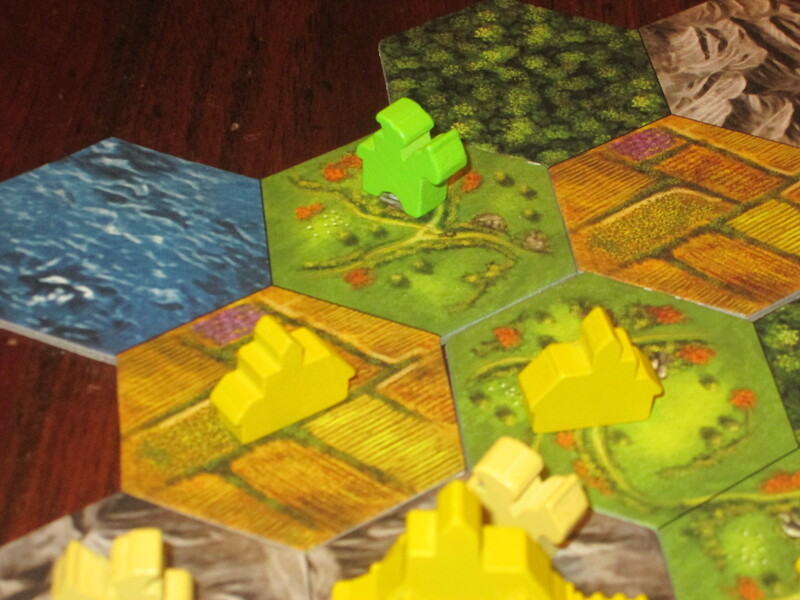 Barony is a strategy game for two to four players. Players strive to earn resources to purchase titles of nobility. The player with the most victory points when one player earns the title of duke wins the game and is crowned the new king. Barony set up for four players. The map looks big, but it’s less open than you might think. 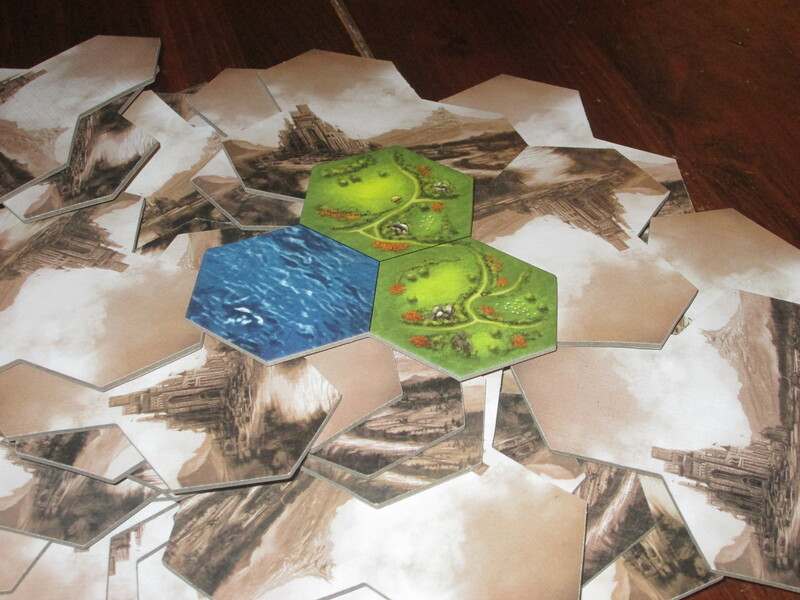 To begin, players lay out the tiles to form the board, nine three-hex tiles for each player in the game. Each player takes all the playing pieces of one color. 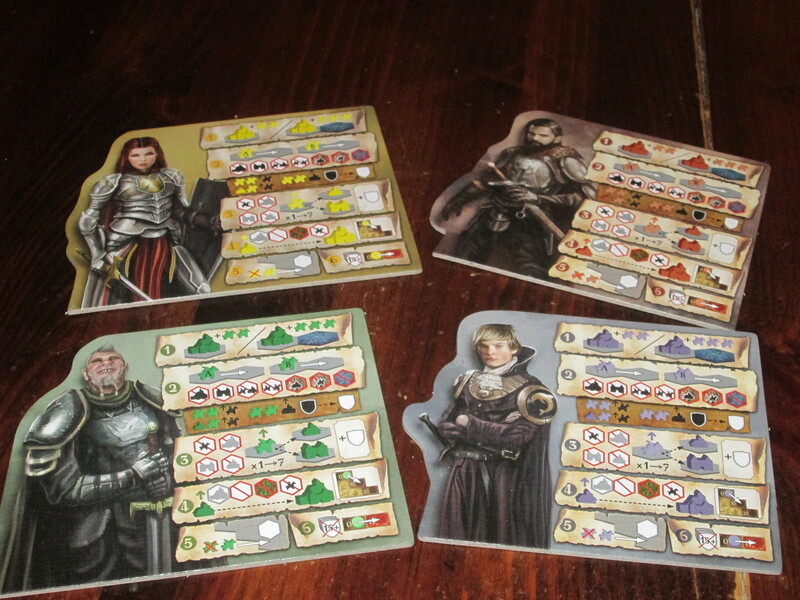 Players choose a starting player, and in turn order, each player places one city and one knight on the board. The last player in turn order places all three of their starting cities/knights at once, and in reverse player order the other players place their remaining two starting cities. The game ends once one player achieves the title of duke. 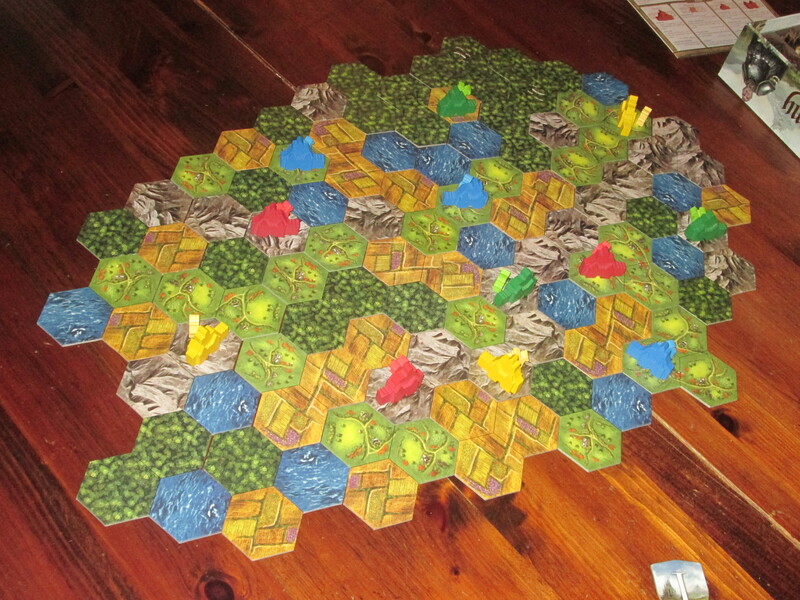 The round is finished, so each player receives an equal number of turns, and players add the silver value of any remaining resources to their score. The player with the most points wins. The score track for Barony. The scoring structure is very simple, highlighting the efficiency game that Barony is. Marc André, like Donald X. Vaccarino, is doomed. It doesn’t matter what his future games are like–they will always be compared to his smash hit first game, Splendor (a game I very much enjoyed). Indeed, while I try not to review games simply as comparisons to games that have come before, there will be some of that here, namely because what interested me about Barony was the designer alone. The reason Barony’s pedigree is what interested me is that Barony isn’t what you’d call an “innovative” game, at least as we usually think of innovation. There’s no new mechanism or component; there’s no strong thematic hook; there are no gimmicks. Yet what is noteworthy here is the way Barony distills a larger, more grandiose game into a manageable package that new and veteran players alike can (mostly) digest on a similar level and enjoy together. Barony, in this respect, is quite similar to Splendor. Splendor boiled down the engine-building genre into its bare essentials and built a compelling game around a one-action-per-turn efficiency structure that invited players to compete on an even playing field. The player aids for Barony. They are a bit confusing at first, but once you know what the actions generally do, they are helpful. But this is where the similarities between the two games end. Barony is very much its own game. While Splendor is a Eurogame boiled down to its essence, Barony is the distillation of a more thematic, “dudes-on-a-map” style game. And this makes it quite a different beast. The first thing you notice when setting up a game of Barony is, “Wow, there are a lot of tiles on the board. This board looks huge!” The second thing you notice, once you start placing your initial cities on the board, is “This board is way too small, and how am I ever going to get anything accomplished!” It’s amazing how quickly your perspective shifts once you become acclimated to the starting sprawl and then realize you have to play a game on the map. The map in Barony is made up of nine terrain tiles per player. 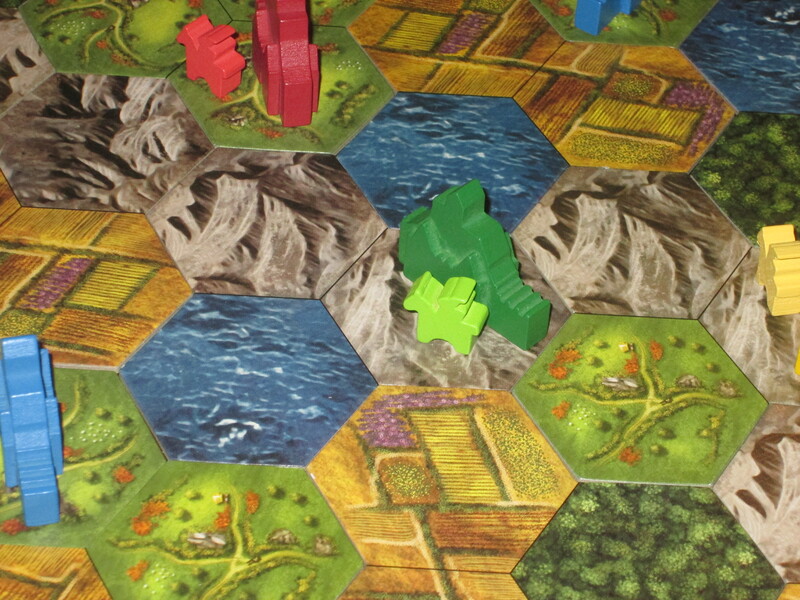 Each tile is made up of three terrain hexes, and players can arrange the board however they want at the start of the game. The reason the map begins to feel tight quickly is the terrain restrictions. Barony is more a game of restraint than of freedom. Players cannot traverse lake tiles at all, so these form natural barriers. Players cannot traverse mountains if any opposing piece is in the space, which is a second terrain that, if you don’t control it, becomes impassable. And forests cannot house cities. That’s three terrain types with restrictions, and when you look at the board, it’s easy to become overwhelmed at how boxed in you are likely to be. It’s easy to feel the pressure right away, but the simultaneous expansion and contraction of the board is one of Barony’s chief distinctions, because in Barony, there is nowhere to hide, and if you want to win, there is no way to avoid conflict. At Christmastime my sisters will sometimes play Bohnanza, a trading and negotiation game, but you wouldn’t know it’s a trading and negotiation game listening to them play. “Oh, you want a blue bean? Sure, you can have mine,” they say. How beautiful when sisters dwell together in peace. Also, how utterly boring. I mention this annual scenario because there is no opportunity for such peaceful coexistence in Barony. Resources! These drive the action in the game and propel it forward. Each terrain type (save lakes) have a matching resource that players collect when building villages or strongholds. The reason for this is that what drives the game forward is resources. There is only one way to end the game: someone earning the title of duke. And the only way to earn titles of nobility is through gaining resources. You can delve greedily in the mountains all you like, but no matter how deep you delve, you won’t find the Arkenstone. The highest-valued resources are available on the fields and plains. And these terrain tiles are scarce. Scarcity makes these areas hotly contested, and it’s not uncommon to see them change hands again and again or to see players fiercely commit their forces to keep these areas from being plundered. But terrain isn’t the only place you’ll meet scarcity in Barony. Each player has a limited supply of pawns–both buildings and knights–and players have to be judicious in how they deploy them. 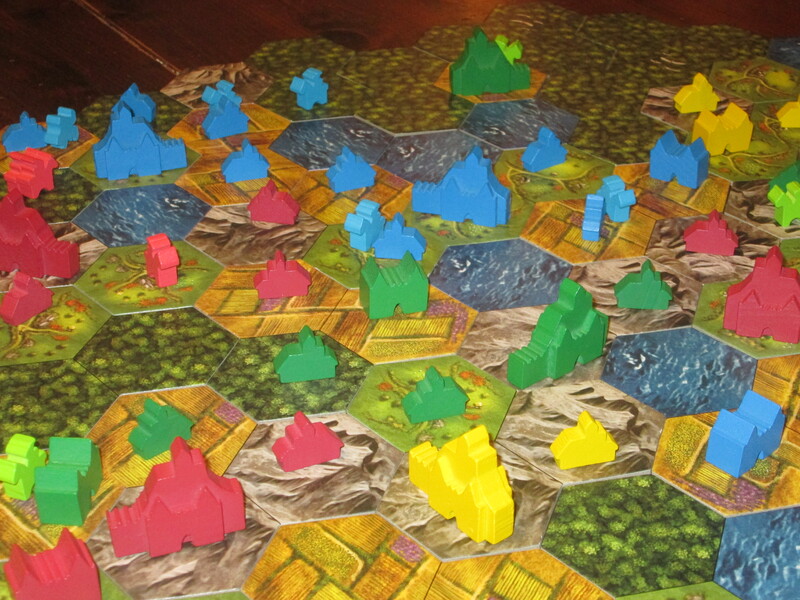 Each player is given only two strongholds, which function like villages, but they cannot be traversed by opponents. Strongholds are key to molding the board around your barony, so players have to be wise in placing them. Similarly, because opponents can’t enter mountain hexes where you have any of your pawns, any villages placed in the mountains are essentially dead pieces in the game–there’s no way to get them back save by building a city. Seven knights at the start of the game seems like a lot, but when your opponents are closing in around you, you’ll wish for more. There are enough pawns in each color to give players options, but enough restrictions to make every placement on the board count. 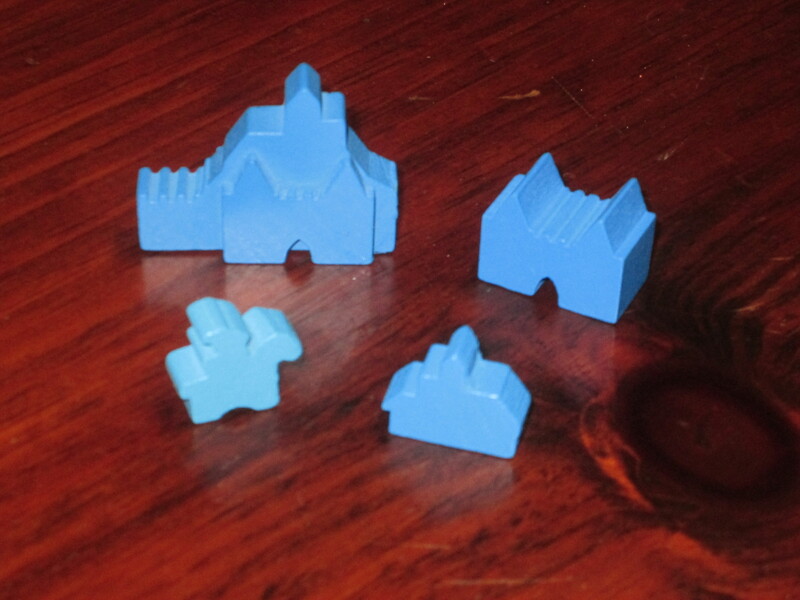 The different player pieces in Barony. There are knights, villages, strongholds, and cities, and there never seem to be enough of them, so players have to be judicious in placing them. And even more limited than pawns is a player’s actions. Each turn is a single action, and then it’s the next player’s turn. This keeps the game moving briskly, but it also means that every turn counts, and you can’t do everything you want to. Earning resources is a must, but banking them (earning a noble title) seems like a waste. Yet when other players are closing around you, it might be more urgent to buy titles to keep your resources from filling enemy coffers. It’s hard to know how best to allocate actions, which is part of what makes the game interesting. If the player to your left is adding knights to his city on your western border and the player to your right is preparing an attack on the east, you can’t defend yourself everywhere. Barony is very much a game of calculated losses–of deciding what’s worth it to protect, what you can stand to let go, and of trying to force players to choose a less efficient means of accomplishing what they need to do. Strongholds can impede opponents’ movements. But be careful: you’ve only got two you can build in the game. Because actions are so scare, efficiency is the name of the game. 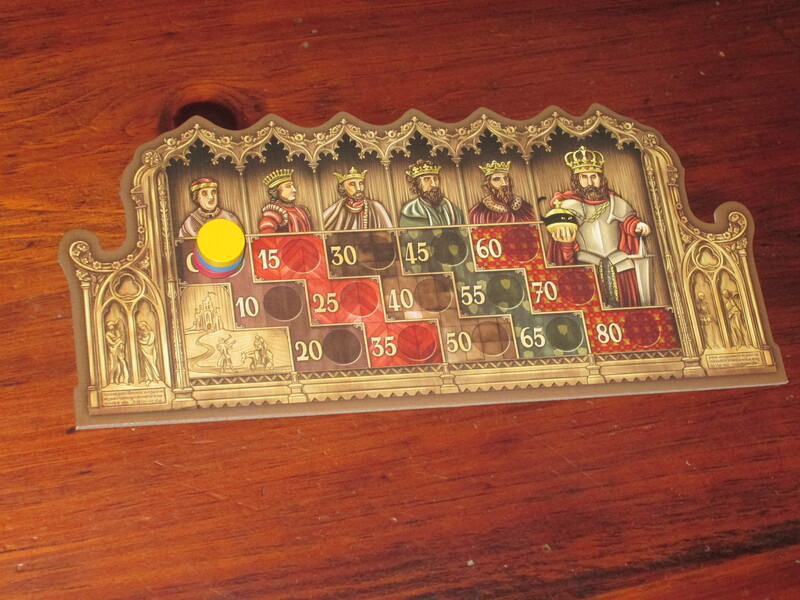 Each player will have the same number of actions in the game, so when one player earns the final title of nobility, each other player will have had a more or less even chance to do the same. On the face of it, this makes the scoring sound boring. Every game ends with a dukedom, and there isn’t a whole lot of variation in scores, especially among players of similar skill. But what this honed scoring system does is remind players that Barony is a race, and the player who best optimizes his or her moves will emerge victorious. Green has a city in the mountain. This alpine fortress between two lakes prevents other players from getting through. At least, that’s the idea. But Barony has the added layer of conflict, which can mar the game for some. This isn’t Splendor, where the worst an opponent can do is steal the card you wanted from under your nose (usually because you were greedily hoarding chips). Opponents in Barony can outright impede your progress and set you back. And unlike the indirect attacks in, say, Dominion that affect all players equally, attacks in Barony are targeted. This can be a natural balance to keep one player from pulling ahead, but it can also make the game less fun when you are the frequent punching bag for aggressor neighbors. 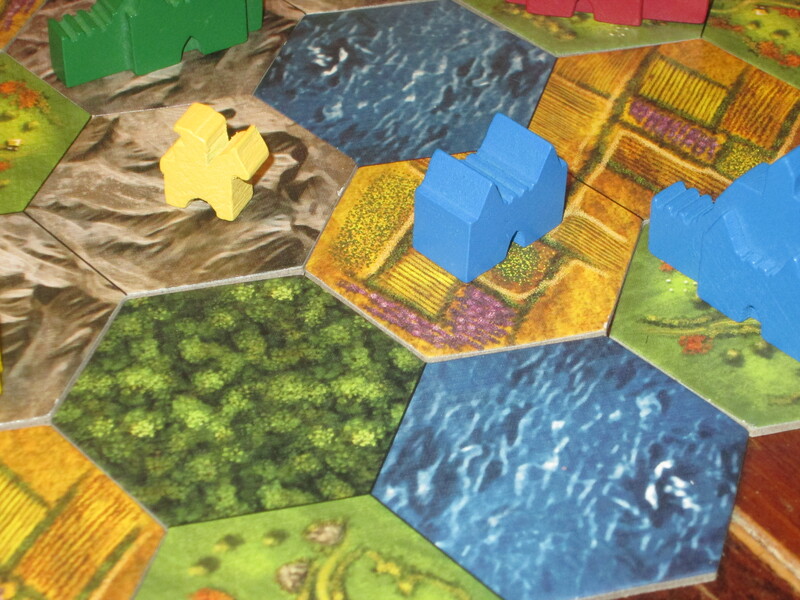 Admittedly, I am not a fan of direct conflict in games, and as such I hated my first game of Barony. It was a three-player affair, and I was caught in the middle of the board between two players. These two players were mostly isolated from each other, so I was the only one who could keep one player from advancing toward the win. My turns were spent attacking one player, and the player I didn’t attack spent the next turn attacking me. It was difficult to gain ground, and one player still ran away with the game. This was not a fun experience at all. But what I realized through this is that I wasn’t playing the game smartly, and I could have saved myself a lot of heartache by making better choices at the start of the game. Indeed, initial placement in Barony is absolutely crucial. If you make poor placements, you are in for a brutal and unfun hour. The board gets crowded–FAST. Because there isn’t enough room for everyone, conflict is inevitable. 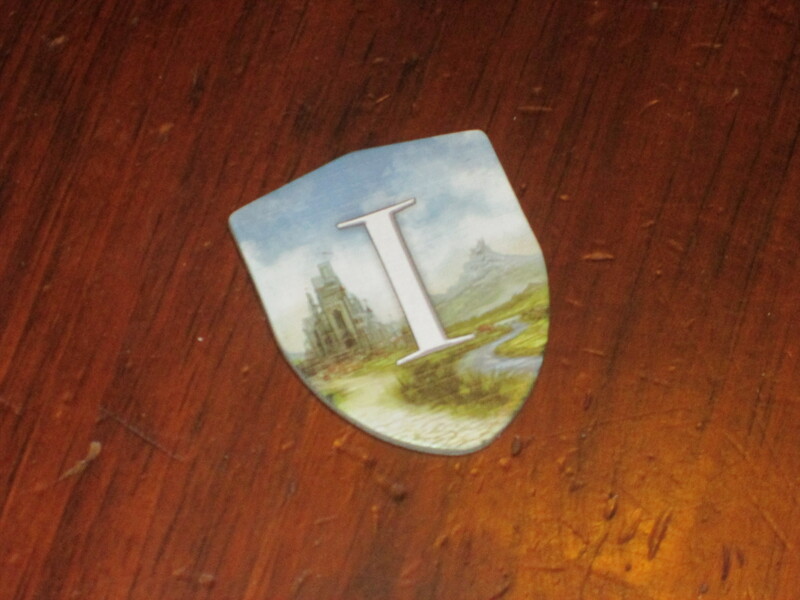 What this (and subsequent, much more pleasant plays) revealed to me is that Barony is a fairly opaque game. While it has the simplicity of a game like Splendor in the actions you can take and even a clear end goal, the path to victory is much less transparent. And because so much of the game is dependent upon a player’s first city placements, if a player misreads the board (which is easy to do–you may not always see the easy wall an opponent can set up or the vulnerability of building close to other players), the conflict necessary to hold the game in proper balance can be thrown off, making a runaway leader (and, thus, probably a runaway loser). So while the game’s slender rulebook (a mere four pages) and simple turn structure make the game easy to teach, I wouldn’t consider Barony a good game for beginners. It requires more advance planning and tactical expertise than a more forgiving game might. 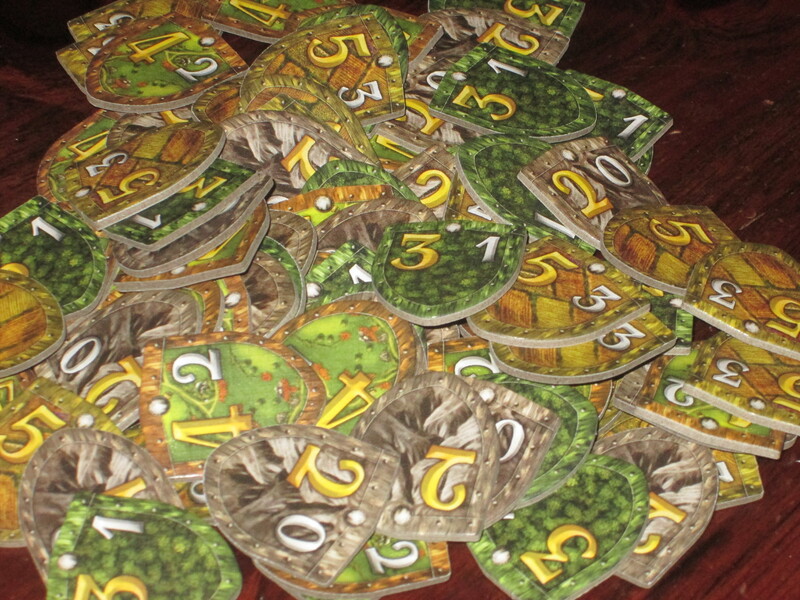 A first player marker comes with the game so players can easily track that each player gets the same number of turns. The expedition action–because it involves permanently sacrificing a knight–isn’t used all that often, but it can be a crucial way to get on another part of the board. The components in Barony are well done. The wooden pieces are interesting shapes and easy to recognize on the board, and while the neon coloring on the knights is puzzling at first, it’s nice to be able to see at a glance the pieces that an opponent can move to harm you. The resource and terrain tiles are sturdy, and I like the modular board, which rather than a gimmick, works well here, truly making each game unique by the layout of the terrain. The player aids, while incomprehensible at first glance, make sense once they are explained and are a helpful reminder of the actions you can take in the game. The components are good without seeming lavish, although the gold lettering on the box definitely leans in that direction. 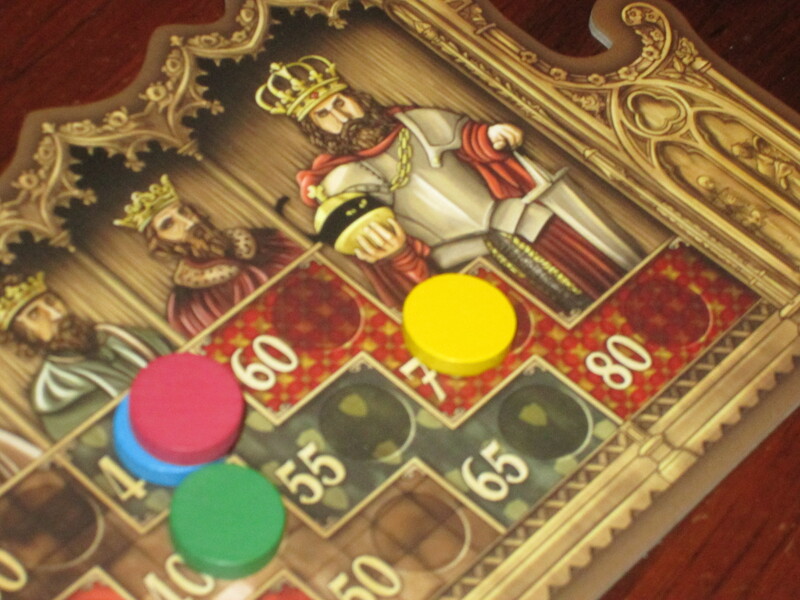 The game plays well with the advertised player counts, although for my taste, I think the four-player game is best, even if it can devolve into kingmaking. Looks like yellow is the duke…and probably the winner. Games of direct conflict aren’t usually my bag, but Barony is a game I can get behind. The actions are simple, and while the board state is sometimes difficult to parse and the path to victory opaque, when I lose, I feel thwarted by my own tactical errors rather than a misunderstanding of the rules. Barony is not the kind of game I’m itching to play, or one that I want to play often, but it’s one I can enjoy with my bellicose friends who think Splendor is a snooze without resigning myself to the frustrating imbalance of asymmetrical player powers or all-day rules explanations. Barony is a good game well suited to its audience and broad enough to have some crossover appeal. For my tastes, I prefer games of indirect player interaction like Splendor, but Barony proves that Marc André is a designer to watch. 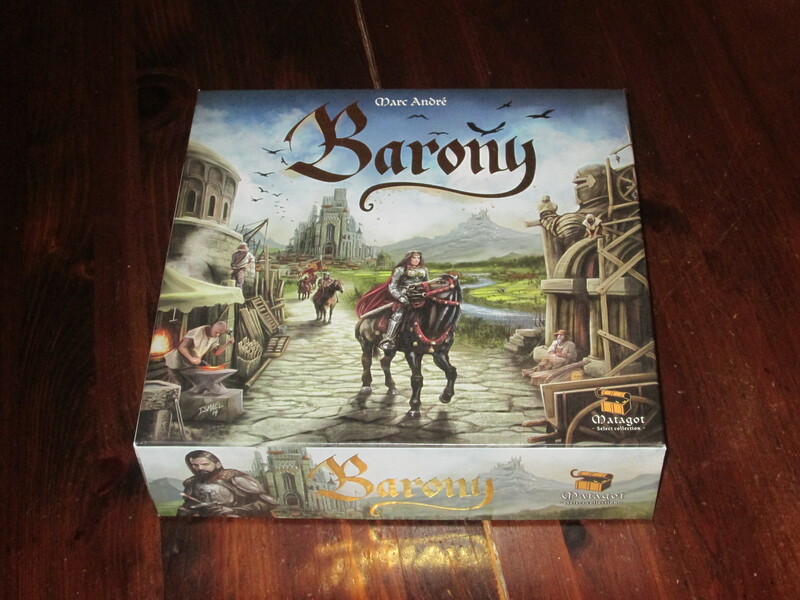 iSlaytheDragon would like to thank Asmodee USA for providing us with a copy of Barony for review.